Think. Invent. Organize. Share. Don't be evil. And change the world. 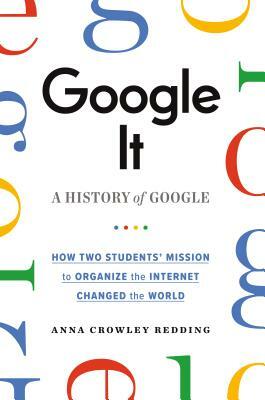 Larry Page and Sergey Brin started out as two Stanford college students with a wild idea: They were going to organize the world's information. From that one deceptively simple goal, they created one of the most influential and innovative companies in the world. The word “google” has even entered our vocabulary as a verb. Now, find out the true history of Google—from its humble beginnings as a thesis project made out of “borrowed” hardware and discount toys through its revolution of the world's relationship with technology to a brief glimpse of where they might take us next. In Google It, award-winning investigative reporter Anna Crowley Redding shares an inspiring story of innovation, personal and intellectual bravery, and most importantly, of shooting for the moon in order to change the world. Before diving into the deep end of writing for children, Anna Crowley Redding's first career was as an Emmy-award winning investigative television reporter, anchor, and journalist. The recipient of multiple Edward R. Murrow awards and recognized by the Associated Press for her reporting, Redding now focuses her stealthy detective skills on digging up great stories for kids--which as it turns out, is her true passion. Google It! is her first published title.